*Please note that the links to the content in this Part will direct you to Westlaw AU. If you are using Checkpoint, the links can be found in the CP PDF at the bottom of this post. NB: Please note that from now on, all updates will include links for Westlaw AU only (with the exception of the Journals available on Checkpoint, which will have an extra PDF). For further information, please click here. Circular priority problems arise where more than two parties claim to have a preferred entitlement to a common item of collateral, but the net effect of the individual priority rules is that none of the claimants has priority over all the others. In other words, in a priority competition between A, B and C, the relevant priority rules give A priority over B, B priority over C, and C priority over A. Courts and commentators have struggled over the centuries to develop satisfactory responses to these circular priority conundrums. This article begins by considering how courts in Australia and England have endeavoured in the past to deal with them. The article then looks at how circular priority disputes can arise under the secured transactions regime established by the Personal Property Securities Act 2009 (PPSA), and draws on a combination of the language of the PPSA, case law and commentary from the United States and Canada, and pre-PPSA jurisprudence to suggest how those circular priority disputes should be resolved. The article concludes by considering whether there is a case for legislative reform. This article examines the extraterritorial application of Pt IV of the Competition and Consumer Act 2010 (Cth). It considers the general principles governing the extraterritorial operation of statutes, the extension of Pt IV to conduct engaged in outside Australia by residents or bodies corporate carrying on business in Australia, how concepts such as markets and competition may have extraterritorial operation, and how the cartel provisions of the Act potentially apply to cartel provisions made or given effect to outside Australia. The article commences with a discussion of some general principles limiting the territorial application of statutes, including the constitutional sources of the power to legislate extraterritorially, followed by a discussion of the tensions between comity and the effects doctrine under American law, before considering how overly wide extraterritorial operation of antitrust laws by one nation can result in blocking statutes by others to prevent incursions into their sovereignty. The author then considers particular provisions in the Act that have extraterritorial operation, including the definitions of “market” and “competition”, before discussing the extraterritorial application of the Act provided for in s 5 (with particular emphasis on the carrying on business requirement). Finally, the author considers the extraterritorial operation of the cartel provisions of Div 1 of Pt IV and briefly discusses the requirements for service out of the jurisdiction. Limited space precludes consideration of international cooperation agreements or other potential means of harmonising world antitrust laws. This article examines the position of the small business as “consumer” under existing consumer protection legislation and the incongruities arising from this characterisation in the area of consumer credit regulation. While the inclusion of small businesses may be defensible under the Australian Consumer Law, it is contended that this is not the case in consumer credit regulation. It is arguable that such an inclusion impacts significantly on commercial dealings and could have a lasting effect on the availability of credit to small businesses. 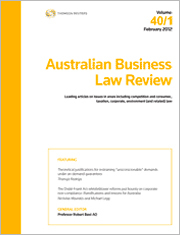 The effects of treating businesses as consumers in relation to consumer credit transactions are far-reaching, potentially affecting the power of the courts to make winding-up orders under the Corporations Act 2001 (Cth) and also countenancing insolvent trading under the hardship provisions. For the pdf version of the table of contents, click here: WAU – ABLR Vol 42 Pt 2 Contents or here: CP – ABLR Vol 42 Pt 2 Contents.